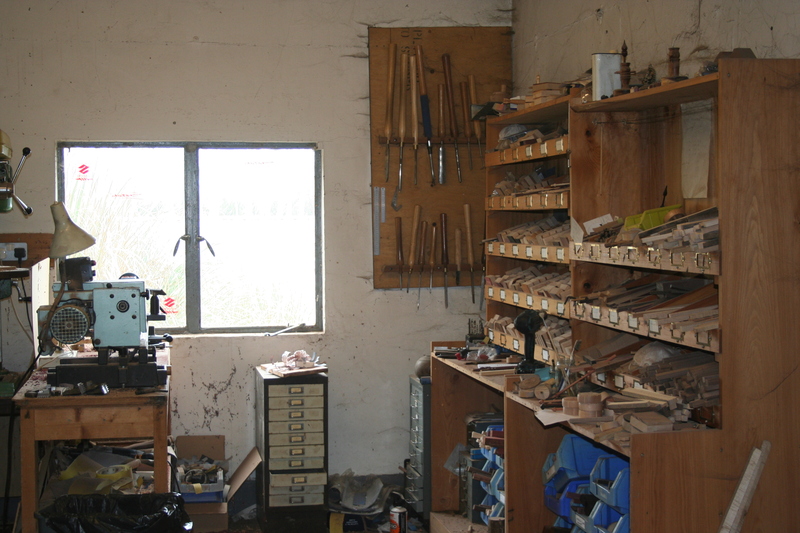 Dear Wovember Readers, we have another evening with Ian Tait, who runs IST Crafts. Yesterday we heard from Ian in his own words, but tonight we’ll feature a new edition of a Q&A originally posted in the the Ravely Spindle Candy group. I feel Ian’s approach to spindle making, and his use of materials really resonates with Wovember’s ethos about wool; I hope you’ll agree. With many thanks to Diana, aka Chewiedox on Ravelry, for letting Wovember share her excellent interview with Ian, and thanks to Ian for updating the answers, as things have changed a bit since Diana ran the interview. 1. A recently released book by Matthew B. Crawford entitled “Shop Class as Soulcraft” puts forth the argument that skilled craftsmanship and hand labour offers an undervalued yet vital contribution to modern life. The 21st Century world places a definite emphasis on technology. Mass-produced items made in factories where the maker never sets eyes on the end user are the norm. As a woodworker and crafter of fine fiber tools, you often get to interact with the person who will use and cherish what you create. Do you find this aspect of your work more fulfilling than your previous incarnation as an IT professional? If so, how? Certainly one of the pleasures of making tools for fibre crafts is the e-mails of thanks and appreciation I receive. Also at the shows I have attended talking to my customers is a delight. Trying to compare it with my old job is difficult, I did enjoy being an IT Project Manager but nothing quite compares with holding a finished spindle. Knowing that I have designed it, selected the wood and physically made it. It also helps that I just love wood. With regards to the book (which I haven’t read) I agree in principle. My personal view is that the world would be a poorer place without individually created items be it a Drop spindle or a hand knitted jumper. One of the advantages in making tools for other crafts people is that they are more appreciative of what goes into making things and value an item for the skill involved. 2. Since so many breeds of sheep originate in the UK and wool has played such an important role in your nation’s history, it amazes me that there so few UK based spindle makers with international exposure. Do you think that the hand-spinning “Renaissance” is just a little late in reaching the UK or are there other reasons why we aren’t hearing about more of you? I think the “renaissance” has arrived in the UK, it’s quite fashionable to knit. However I think spinning is a little way behind, but gaining ground. The number of spindle makers has grown in the UK over the last few years. With some like my self providing the service of choice, but with the draw back of having to wait for an individually crafted item. Others opting for the make it and sell it on Etsy option. I have noticed that this seems to be the trend in the US as well. Ultimately I think it’s down to economics, trying to earn a living from a ‘craft’ such as making spindles is very difficult. I rent a small business unit so have rent to find, also local council tax and insurance which is expensive. I have just had to buy a new van and with my bank charging me 15% interest it makes life difficult. I quit often work seven days a week and 12 to 14 hours a day. And even now I could not live on what I make! I also feel that this reflects back on what was discussed in question 1. How many of us are willing to pay anything from £60 to £120 an hour to get our car serviced yet are reluctant to pay £5 an hour for a hand made item? 3. Your spindle designs are the result of refinements that you have made based on feedback from spindlers. Do you enjoy this ‘collaborative’ part of the design process? I think that here it also help if you have an understanding of the use of the tool. I can spin on a drop and Turk and plan to learn on a supported. So, in answer to the question… Yes, I enjoyed this collaborative part of the design process. The thing to remember with asking for feedback is that negative comments that are the most productive. Since then the design has settled down, but I still enjoy making “custom” spindles, as there is a certain amount of personal preference in choosing a spindle. I normally do not charge any extra for this service. 4. What are your favorite woods to work with, and why? Tulipwood Dalbergia decipularis. It works well and just has such an amazing colour range from pale almost white through pink to red and even dark purples. I also love the smell of freshly cut Tulipwood. English Oak Quercus petraea. The king of English timbers. For me there is an association with the building of the sailing men of war. If you have looked at my web site you will see that I am also into making model boats especially the old sailing men of war. Sycamore Acer pseudoplatanus. A much underrated timber in the UK. It is a member of the Acer family much as American Maple is. I tend to use mainly Ripple (fiddleback) Sycamore and there is nothing prettier that a just planed piece. It just shimmers. 5. Some of the “burred” woods featured on your spindles have natural fissures that you infill with epoxy mixed with brass filings. The result is a jewel-like, yet organic appearance, similar to that of a vein of precious-metal ore. Tell us how you arrived at this method of combination wood-stabilization/ design element. Like most ideas it arrived in small steps. I had just had feedback from Carol Leonard who was talking about the weighting of the whorl, which gave me the idea of the shape of the whorl I wanted to achieve. This led to thinking about adding more weight to the rim. Not liking to throw things away I had a bag of brass shavings from making tips for my Tapestry Bobbins, so I started experimenting with mixing it with epoxy to inlay into the rim of the whorl. I expect quite a few people on Ravelry have a stash of wool which they are not sure what to do with. Well I have had this large lump of Oak bur knocking around the work shop for a few years, not quite sure what to do with it. I had looked at it a couple of times with the view to making some caps for the whorl, but it had a number of holes and fissures which I felt would be unsightly. Stability would not be a problem as it would be laminated to a Ripple Sycamore base. From here, I was cutting some brass rod and was left with fair quantity of brass filings. Brilliant, I thought. I could use this rather than the brass shavings and the filings would give me a very fine infill for the Oak burr. 6. On the opening page of your website, you have a mission statement. The third item on that statement is: “To use the resources that are entrusted to us with reverence and respect.” Living on an island in the English Channel, how difficult is it to implement that policy, how do you do it, and why is it so important? I think first thing here is to say that the Isle Of Wight is only just off the south coast of the UK. The ferry time is 10 to 20 minutes for foot passengers and 45 to 120 minutes for cars etc., so on a day to day basis living on the Island has very little impact on trying to achieve this statement. On reflection, it has some advantages. For example when I buy wood, rather than just jumping in the van and going I have to plan it so I will visit several suppliers in one trip rather that making several trips. I am sure that most Ravelry users will understand the joy and pride in hand crafting something to the best of their ability. Be it a pair of socks, a drop spindle or a tapestry bobbin. How can you achieve this if you don’t respect the materials you are using? So one aspect of this mission statement is just the respecting of the material that I use for what it is. another aspect of this statement is more environmentally driven. There can’t be many people who are not aware of the impact we humans are having on this tiny speck of dust we call Earth. I am fortunate that I live in a fairly rural area and one of my pleasures is visiting the beach, walking in woods, seeing a porpoise swimming in the Solent or a red squirrel. We are all part of this Earth and I am sure that we are all poorer for each patch of nature that is lost. Also I have a 17-year-old daughter and I don’t want her to grow up in a world that has no wild places or elephants or polar bears or tigers. So I endeavor to use resources with care and with a view to the environmental impact. Each morning when I arrive at my workshop the first thing I do (after making a cup of tea ) is to spend 15 to 30 minutes meditating. 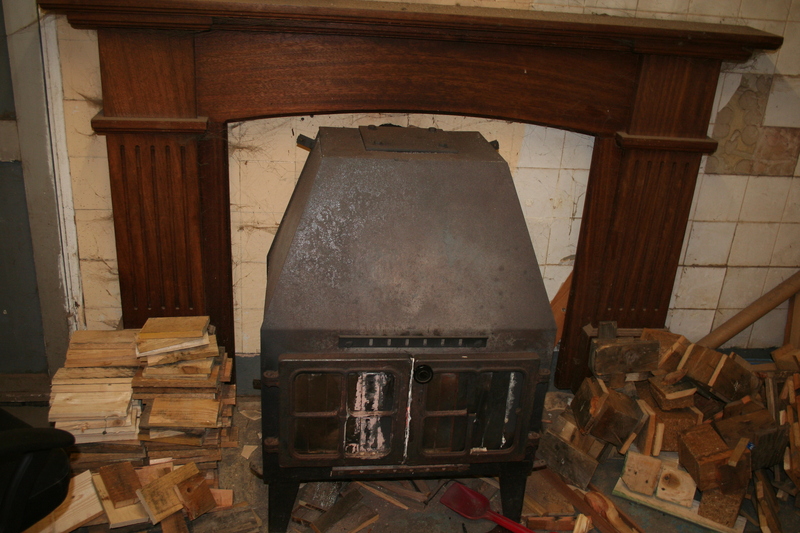 I have installed a wood burning stove in my workshop and fuel it by burning old pallets that other wise would have been sent to the local municipal tip. Please note I do not use pallets that will be returned, but being on an Island quite a number are shipped over and left. I only buy my timber from firms that operate an active environmental policy. The whorls are designed to use the minimum amount of exotic timber. I live close to where I work and often cycle there. 7. Do you do fiber festivals or are there other places where prospective customers can test-drive your spindles? If so, where? Yes I attend a number of Fibre festivals, more this year than ever. The main ones being Wonder Wool Wale, Fibre Fest in Cambria and Fibre East. The previous two years I have traveled to Germany to attend their ‘Spintrifen’ a long weekend spinning retreat run by their Guild. Having had a rather bad winter last year with some health issues it has left me playing ‘catch up’ most of this year. And I am acutely aware that my online order delivery times have suffered. So I need to strike a balance with the shows and my online sales. 8. What message would you like to send to a prospective spindle-buyer who may be learning about IST Crafts for the first time? All my current spindles are of a rim weighted design and I take pride in making them. So they spin! I test each one on a test rig before it leaves me, set the hook and check for trueness of spin. 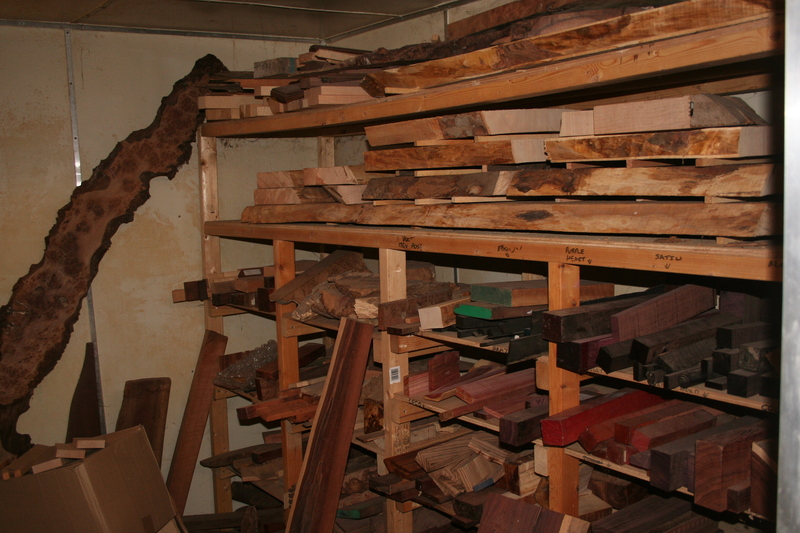 I am always happy to make a specific weight or a different combination of woods, just e-mail me. 9. Now that you have taken up spindling yourself, has that contributed to the way you view the spindle as a tool? If so, how? I am still very much a beginner when it comes to spinning, but even so it has given me more of an appreciation that I am making a tool that will be used. Looks are important but it also needs to function well. 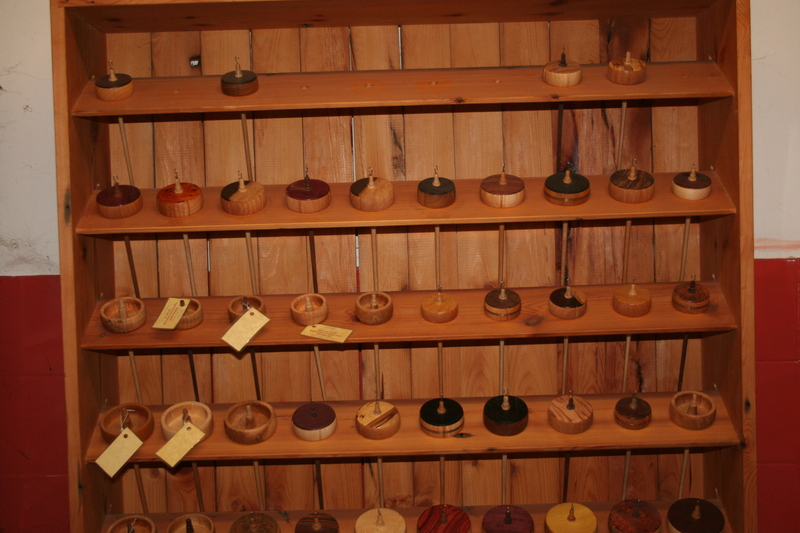 Many thanks to Ian for talking to Wovember about his approach to spindle making.